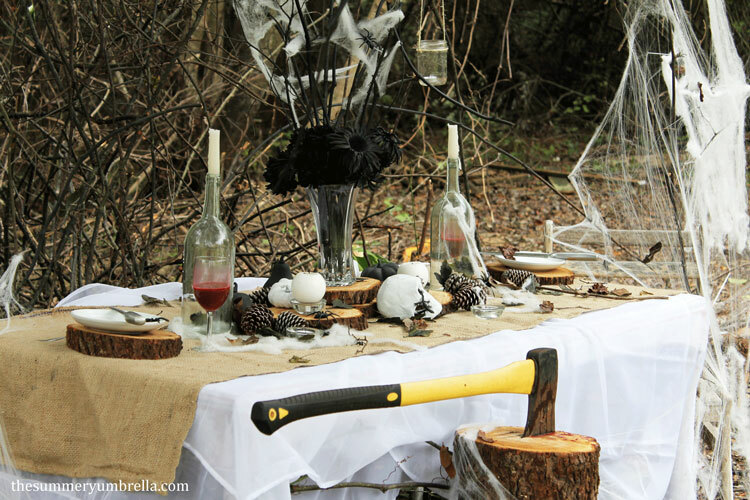 Learn how to design the How to Create the Most Amazing Rustic and Spooky Halloween Table Décor for your next party! 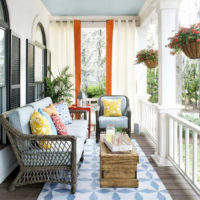 Super simple AND gorgeous! 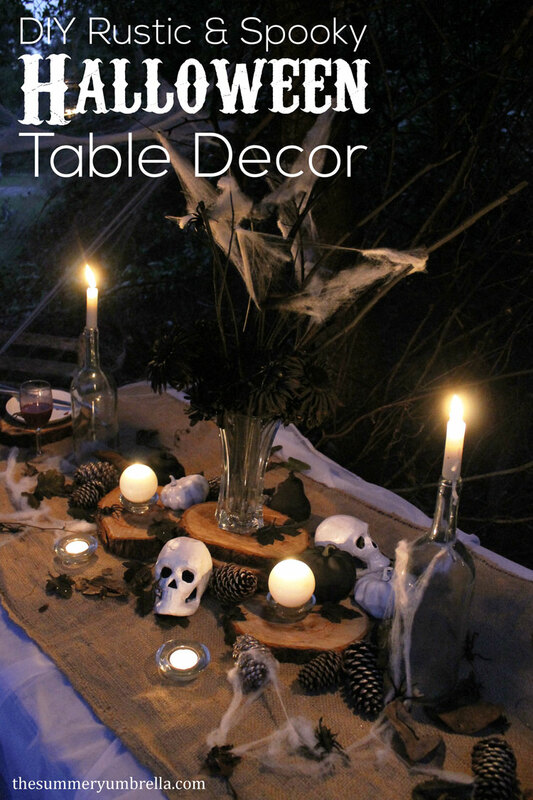 I’ve been wanting to create a Rustic and Spooky Halloween Table Decor display for some time now, and when I realized that it was already halfway through the month I knew I needed to get on it ASAP! First, I started formulating an idea on what table I was going to use and my centerpiece. If you follow me on Instagram you’ll know that Mike recently cut down a tree (remember my order for wood slices? ), and is clearing out a part of the yard that has become overgrown with crazy grapevines. This part of my yard definitely creeps me out, and I figured it would be the perfect place to put up my decorations. Thankfully I always seem to have extra artificial flowers around the house so I just picked out a few of my favorites for my centerpiece, and spray painted them black. Normally I wouldn’t recommend spray painting your flowers, but since they’re supposed to look dead anyways no worries in this department! 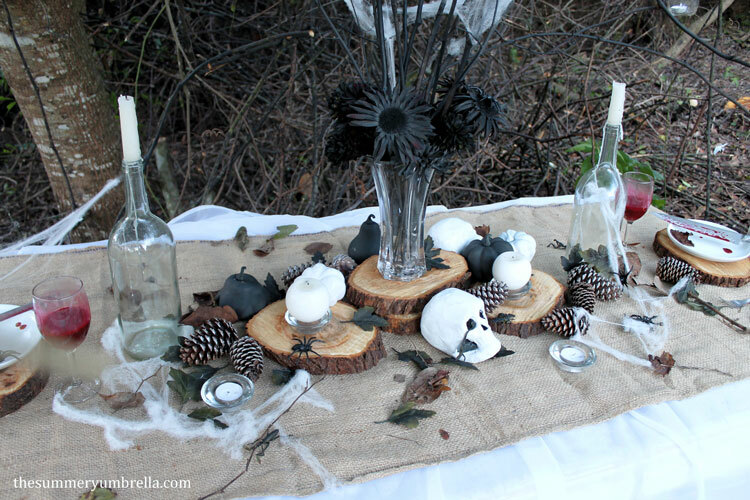 I wanted to add some height to myRustic and Spooky Halloween Table Decor centerpiece so what better to use than branches? Once again, I just spray painted these puppies black, and waited for them to dry. I have found with projects like this the cheapest spray paint you can find usually dries the fastest. Next, Mike and I dragged out the table I was going to use and a few chairs. I wasn’t sure what kind of a table cloth I would want to use so I started off with using two white, sheer curtains that I stole from one of my windows. So far, so good! Isn’t this “backdrop” creepy? Eek! Mike had left his ax nearby, and I couldn’t resist adding this element to really amp up the spooky factor. Since I added the ax to the decor I knew I would need to incorporate a little bit of blood. This was my first attempt. Just water and red food dye. Yea… no good! 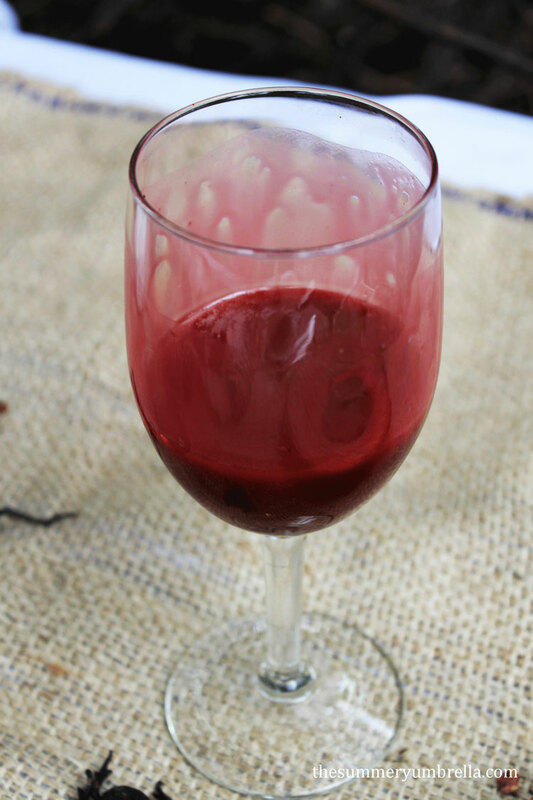 Once I found the consistency of what I thought blood looked like I poured it into the two wine glasses I was going to use, and swirled it around the glass like you would with wine. I’m still a little creeped out how well this turned out! I made sure to save a little bit of my blood mixture to add to the ax. To apply, I just used a paint brush to drip it down the edge of the blade, and down the stump. I would have LOVED to have put up an old chandelier, but unfortunately the vines above the table weren’t very sturdy so I used my next favorite option: mason jars with tea lights. 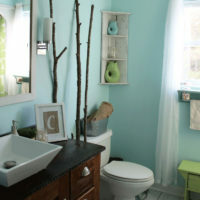 All you need to hang them up is a little bit of twine/twisted rope, and you’ll be good to go! How divine do these wood slices look underneath these plates? *Squeals! 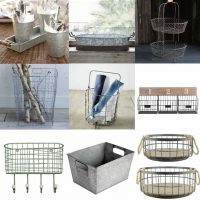 * I absolutely LOVE how they are so rustic, but elegant at the same time. DISCLAIMER: I didn’t have any fake knives so just for pictures sake I used real knives. If you plan on doing a similar display (especially if children are involved!) I would most definitely use fake. Creepy side note: While I was putting together this display an actual wolf spider decided to join me. Umm, I usually don’t mind spiders, but when they are the size of the one on the below plate I start to get a little jumpy. Ew! Do you like to collect old wine bottles? I’m not sure why, but I do. Don’t they look awesome with just candlesticks? 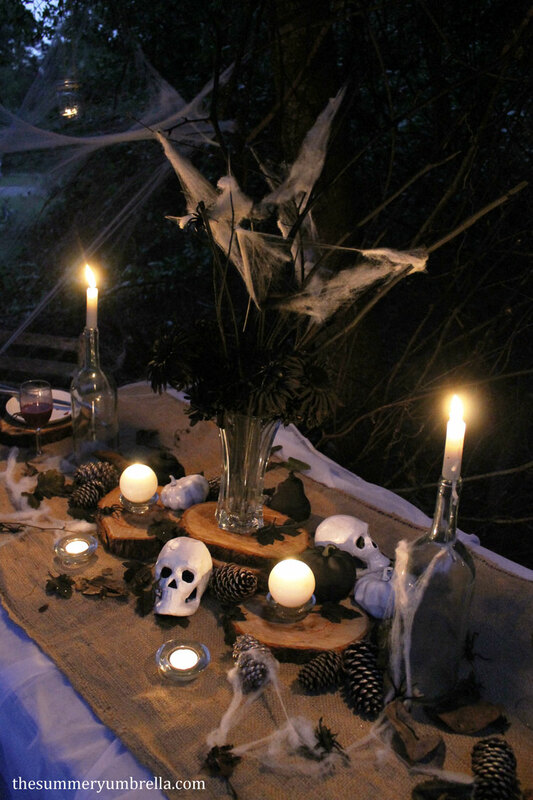 Then I added a few extra candles that I had on hand for the nighttime creepy factor. How can you add more nature and avoid the added expenses of creepy? 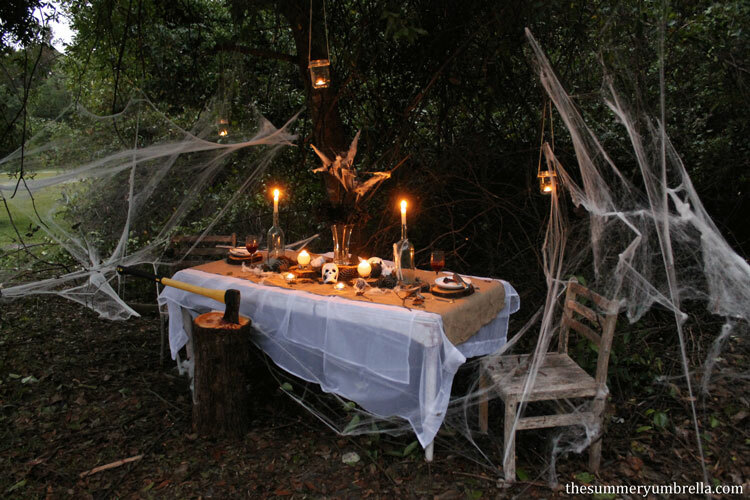 Just add dried leaves, pinecones and twigs. 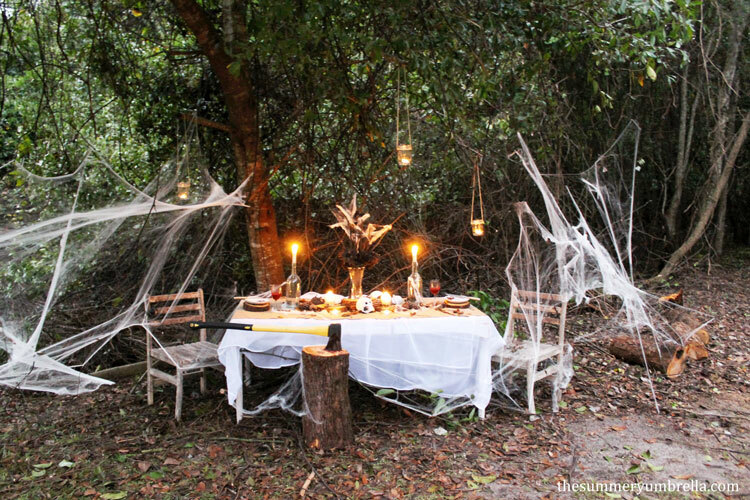 I literally threw the leaves and twigs in the air, and let them land all over the table and spider webbing. I put together this whole display in about an hour and half, but that was mainly due to me being such a perfectionist! Next, all I had to do was wait for the sunset so I could light the candles for the nighttime photo shoot. During this nighttime shoot I think I jumped at just about every sound. Wimp? Uh, yea! But, how awesome did this turn out? !